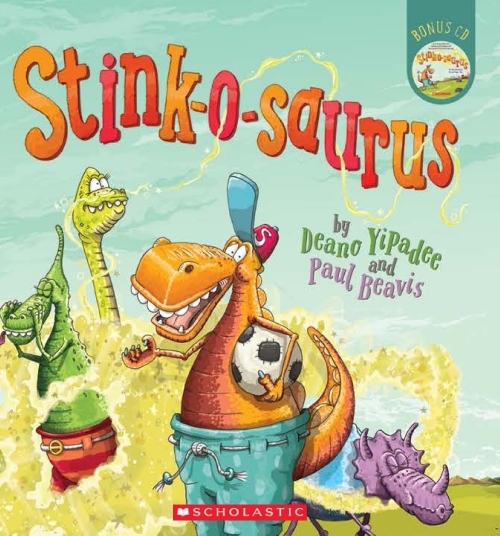 You’ll split your pants laughing at Stan, the world’s only STINK-O-SAURUS. But can his stinky antics save the day and keep Tommy T-Rex far away? From the creators of the hilarious Jingle Bells, Rudolph Smells and Nee Naw the Little Fire Engine. Where were you born? Where do you live now? I was born in Mosgiel (aka Mollywood … locals know the Hollywood-style sign on the hill!). I live some of the year in the UK and some in New Zealand. Where did you go to school? Did you have a nickname? I went to school at St Mary’s Primary School and Taieri High School (now College) in Mosgiel, Otago. My nickname, Deano, still stands. What were you like in school? What was the most outrageous thing you did there? I loved playing in the school rock band and going in school shows from a young age. I once (or twice!) turned up to school on mufti day wearing my school uniform! I wanted a job that had something to do with music, so at the age of 15 I went to the local radio station and asked to do work experience. I remember an audio book that I used to LOVE getting out of the library every year, called Bad Jelly the Witch. It was the best, and I was always so excited to get the cassette tape (I’m showing my age!). Who is your favourite children’s author? I’m a big fan of Julia Donaldson, and Craig Smith’s Wonky Donkey. What is your favourite food/colour/movie? I love so many different kinds of movies, especially comedies like Happy Gilmour or emotionally stirring films such as The Green Mile. Who inspired you to write music? How did you get started? How old were you? I started writing songs in primary school about the age of 10 and have been doing so ever since. In recent years that has evolved into adding more depth of story for kids’ books. Why did you want to be a writer/musician? It’s the best job in the world. Getting to daydream, and use your imagination. Watching kids’ reactions and laughter is priceless, and then seeing their parents behind them during shows getting so much enjoyment out of their children’s reactions is truly amazing. It’s such a rewarding job and I’m the luckiest person in the world to get to do it. How do you think up ideas? Kids during shows normally provide inspiration by talking about things and then quite often the story plot will come to me ?— probably at 3 a.m., bizarrely. I normally jump out of bed when I have a thought and capture it all before I go back to sleep. It then evolves over months of adding and reworking bits. Do you have a special place where you write music? At home, normally after my wife and kids go to bed as it’s really quiet then. What is the best thing about being a writer/musician? Getting responses from people that are enjoying my books, and then of course seeing it in book stores and knowing it started as nothing more than a 3 a.m. thought. It’s amazing seeing Paul’s illustrations come to life with his interpretation of what I have written. I get such a buzz out of seeing his sketches and illustrations. Have you had a funny or embarrassing moment as a writer/musician? YES!!! Can I share it?? Umm, I was doing a show in Japan that involved lots of stories, singing, and dancing, etc. I noticed all of the polite Japanese parents were looking down most of the show. At the end, after walking out, I noticed that my fly had been undone the entire time, and a collection of Japanese mums had seen more than they anticipated, by seeing my Yipadee underpants! What do you do when you are not writing music? I get to spend a lot of time with my two daughters and wife. It’s a brilliant job for having family time and I feel so lucky. I also enjoy going to the gym, and running the other areas of the business. What would you have chosen to be if you were not a musician? I would likely still be working in radio or teaching English in Japan. I loved my time living there! Which famous person from the past would you like to talk to? Dr Seuss, Mother Teresa, or Elvis. Preferably all at the same time in the same room. That would be awesome and enlightening, I imagine! Is there anything else you would like to tell us about yourself? 1) My dad’s name is Brian O’Brien; and 2) I once spent 20 minutes in a room with just me and Justin Timberlake. I had a keyboard and played a song while he beat-boxed! I was born in London, England. In 2012 I moved to Wellington, New Zealand, where I still live. I talked far too much with my friends and would only shut up for lessons in Art, Graphic Communication and History. One of the worst things I did was that myself and a friend cheated on a French verb test that we had not studied for. We had all the correct verbs written on paper that we had hidden and would check our answers against. The problem was, we did too well and were selected to go into French and German classes – learning one language was tough, but two was awful. After just one term we were kicked back to French only. I was never a huge reader but these are the ones that stayed with me: Last One In Is a Rotten Egg, The Machine Gunners, The Snowman, George’s Marvellous Medicine. Who are your favourite children’s picture book author/illustrators? Jon Agee, Alexis Deacon, Lauren Child, Mo Willems, William Steig. Fish and chips sprinkled with salt and vinegar, enjoyed with a cup of tea and a slice of bread and butter. Who inspired you to write/illustrate? My mum encouraged me to draw and paint at an early age and I never stopped doing it. As for writing, I never imagined myself as being a writer as that was done by ‘proper’ people. However, my dad always made things up, based on life, which is a nice way of saying that he liked to ‘stretch the truth’. This was something I picked up and liked doing, but I never realised it would come in useful later in life and that it could be labelled ‘storytelling’. I had three younger brothers. One was just a couple of years younger but the other two were 10 and 11 years younger and I would make up stuff for their bedtime stories. My favourite was what I called ‘high-speed fairy tales’, which were the classical stories condensed into one minute. These would often just be lists of words which made up the elements of the story, they made no sense whatsoever and also made the listeners even more excited and less likely to be sleepy! Again, I never assumed I could make a career out of this. Why did you want to be a writer/illustrator? I think the question is, who doesn’t want to be a writer or an illustrator? It’s great fun, but what they never tell you is that it’s really, really hard work and you have to write and draw a lot of rubbish before you get better – but it’s worth it. How do you think up ideas for picture books? They just pop into my brain. I make a connection with one thing and mash it together with another and take it from there. The tough thing is to work out which are the ideas worth pursuing. I like to write the basic story as quickly as possible so I can see if it works. Then I will spend a number of months picking the story apart and rewriting it over and over again until it feels and reads just right. Do you have a special place where you write/illustrate? I always have a notepad so I can write stuff down or make a doodle no matter where I am. Most of my writing and illustration is done in my little office, but at the early stages of projects I can do both at the library – Wellington has some great libraries. What is the best thing about being an author/illustrator? You can’t beat the feeling you get when a child laughs at something you’ve drawn or written. Have you had a funny or embarrassing moment as an author/illustrator? Once, at an event, I was drawing one of my characters and a young child in the audience asked why the character didn’t have a certain private part of their anatomy. The whole audience giggled and a few turned red – I replied that they might need to ask their mum or dad about that. What do you do when you are not writing/illustrating? I watch a lot of films and I’m always up for a round of crazy golf (I’m pretty good!). What would you have chosen to be if you were not an author/illustrator? I always liked the idea of being a golf caddie, travelling the world and telling the golfer to hit the ball there, and then there, to avoid the sand and trees, and then knock it in that tiny hole right over there. Vincent Van Gogh. It’s not an original choice but his story is such a wonderful mix of the tragic and beautiful. His determination against the odds is always inspiring. And he wasn’t just a great artist; as his letters to his brother showed, he could write wonderfully well.